Santiago Lloclle [photo EFE] was a 19 years old Peruvian farmer. His family and community are in debt, because the prices for fertilizers and water are increasing at alarming levels, and local banks are charging them for late fees. His country Peru has recently signed a free trade deal with the US, which will destroy their economy because local markets will be invaded with subsidized goods. Santiago is dead now, along with three other Peruvian farmers. He was killed after a Peruvian police officer threw a tear gas bomb and knocked him into a ravine in Pedregal, Arequipa, south of Lima. Santiago was angry because the Peruvian government is working against the interests of his people and nobody seems to care about their rights. Those who do, are called terrorists and antidemocratic rebels. Two other farmers, Ruben Pariona and Emiliano Garcia were killed in Quinua, Ayacucho, in the central Andes mountains. The same area where cruel guerrilla group Shining Patch flourished taking advantage of the frustration of local Native peoples back in the 1980's. It is also the place where libertador Simon Bolivar defeated the Spaniards to assure Peru's independence in 1824. One of the killed farmers had three bullets in his head, the other one had two in the same area. There were executed by Peruvian police. 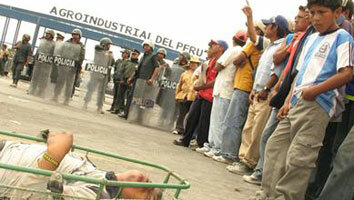 A fourth farmer was killed in Barranca, in the Andean coastal region northern of Lima. At this moment, hundreds of injured farmers are being neglected and some are hiding from the government, because of fear to be incarcerated as it has happened to 160 protesters. Especially, after prime minister Jorge del Castillo has requested four years of jail time for the detained farmers. Peruvian police "was shooting directly to kill them, like a war." said a witness. Alan Garcia, the Peruvian president who had killed thousands of innocent Peruvians during his first government in 1985-1990, is showing no respect for the life and human rights of Peruvians in his current second term. C�sar L�vano, one of the very few independent journalists in Peru has wrote: �The order to kill the farmers came by noon from the government highest authorities, according to a local radio station. In 2007, Garcia himself pushed legislation 982 which grants impunity to police and military personnel that may kill or injure civilians while in duty and using weapons in a regulated way. If police are innocent this time, then Garcia is legally the killer." I agree, it is clear that the orders came from Garcia, his prime minister Jorge del Castillo and the minister of interior, Luis Alva who is in control of national police. Santiago, Ruben, Emiliano and the other farmer from Barranca, they all descend from the Native people that were invaded by the Spaniards in the XVI century, when property was stolen from the original peoples of this continent. As a result, the ancestors of most Peruvians worked for centuries as slaves while they were forced to use Hispanic surnames. Some brave people rejected that rule like Santiago's ancestors whose surname is a Quechua word. In the 1970s, Peruvian president Juan Velasco returned the land to the Indigenous peoples, soon before he was poisoned to death. Farmers in Peru were neglected by following governments, without enough training, education and financial assistance, their production failed. Meanwhile the rest of the world was pointing towards opening free markets. President Garcia was in Madrid last January, and while meeting king Juan Carlos de Borbon and president Jose Rodriguez, he praised genocide Cristobal Columbus and the Hispanic invaders. "I am happy to be in my homeland. We need a second wage of investors, we need the Carabelas ships to return to Peru." said while attendees were shocked. Those words hardly made the news in Lima, where the media is very much manipulated. This time, dishonest media in Lima has called the farmers "delinquents, antisocial, angry mobs" and in most of the local news dead farmers are portraited as criminals. Meanwhile politicians praise the government for its strong reaction. Unlike most developed countries, third-world economies do not subsidize their farmers because that goes against international economic rules, that would be called communism. But industrialized nations like the US spends billions of dollars on paying their farmers so they can assure a good production with reduced costs, and to guarantee enough food for their people, which makes sense. Then American rich farmers go and export the remaining goods to other nations, including poor ones like Peru, thanks to free market. Peruvian farmers cannot compete with that. That is why the campesinos of Peru decided to go on a national strike and to protest blocking roads and towns because they were tired of waiting. In 18 months of government, Garcia had refused to meet them in person to discuss their petitions. But what are the Peruvian farmers asking for? Simple, they want compensations to recover from the negative impact that the US-Peru FTA will cause to them, in order to protect their livelihoods. They want a clear and solid national agriculture legislation at a government level so they know the rules of the game. They are asking for legal protections for their land against multinational corporations, especially in protected areas where mining, oil and natural gas firms are targeting the land of indigenous communities. They are asking for assistance to rebuild their communities after the 2007 earthquake. Finally, they want to keep the right to use natural water sources, rejecting the current government proposal which will charge expensive prices for it. Now, we must be aware that human crisis in the world like the one in Peru, are caused not only by authoritarian leaders overseas, but also by abusive policies directed from rich countries like the US. The Bush administration openly supports abusive governments in Latin America like the one in Peru, led by mentally unstable people as Alan Garcia and his vice president Luis Giampietri, a retired military man with connections with racist right-wing groups and who is the intellectual author of killings of Peruvians in the past decade. Next time you are served in an expensive restaurant in NYC, DC or LA, while you enjoy delicious Peruvian asparaguses, avocados and limes; I want you to think about the farmers of Peru, most of whom survive with an income of less than $2 per day. Think about free trade and its consequences in the whole world, and think about which presidential candidate is most likely to oppose that kind of policies when elected. As right now, the farmer unions in Peru have put their strike on hold as they have been finally invited to talk with the Garcia administration. In seven provinces of the country, Peruvian military has taken over to police streets and to reject any type of public gatherings, limiting free transit of people. The four Peruvian farmers that were killed by the Peruvian government are now martyrs of the struggle for social justice in the world. Their sacrifices will not be forgotten and their example will be cherished. We don't need to wait for more people to die in order to stop injustice for the poor of Peru or any other country. We can act to prevent US-backed free trade policies from expanding their negative impacts in the world. .